Take The Same Automotive Trivia Test We Forced On LeMons Miscreants In The Penalty Box! A recent addition to the Toolbox-O-Cruelty™ used by the LeMons Supreme Court is the Trivia Test. We've got a half-dozen tests, written by members of the Court, and miscreants generally get the choice between LeMons trivia and general car trivia. 1. The technology inside Toyota's first automatic transmission was licensed from another manufacturer. What was it called? 2. Which of the following European cars was the Premier Padmini (built in India from 1969 through 2000) based upon? 4. In which of the following countries was the Fiat 128 never built? 5. In what model year was the ill-fated Cadillac V8-6-4 engine introduced? 6. How many ducks were in the old Cadillac emblem? 7. Which of the following 1974 cars had the lowest list price for the United States market? 8. Which of the following American cars was built in Brazil until 1972? 9. Which of the following German cars was built in Mexico until 1970? 10. Which of the following French cars was built in Argentina until 1990? 11. What kind of car did North Vietnamese leader Ho Chi Minh drive around Hanoi during the 1960s? 12. How many horsepower did the 1958 Studebaker Hawk's supercharged V8 engine put out? 13. What French car provided the ancestry for the suspension design of the 2004 Chrysler 300M? E. You crazy? None of the above! USA! USA! USA! 14. Which of the following cars did mass murderer Timothy McVeigh use as his getaway vehicle from the 1995 Oklahoma City Federal Building bombing? 15. The Chevrolet Corvair was made for the 1960 through 1969 model years. In what year was Ralph Nader's Unsafe At Any Speed, generally blamed for the demise of the Corvair, published? 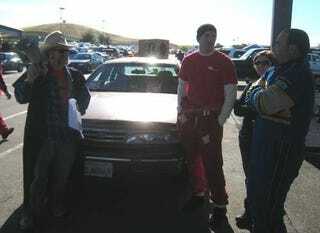 Answers below the photograph of one of the unfortunate teams that received the Cultural Revolution Penalty at Thunderhill.